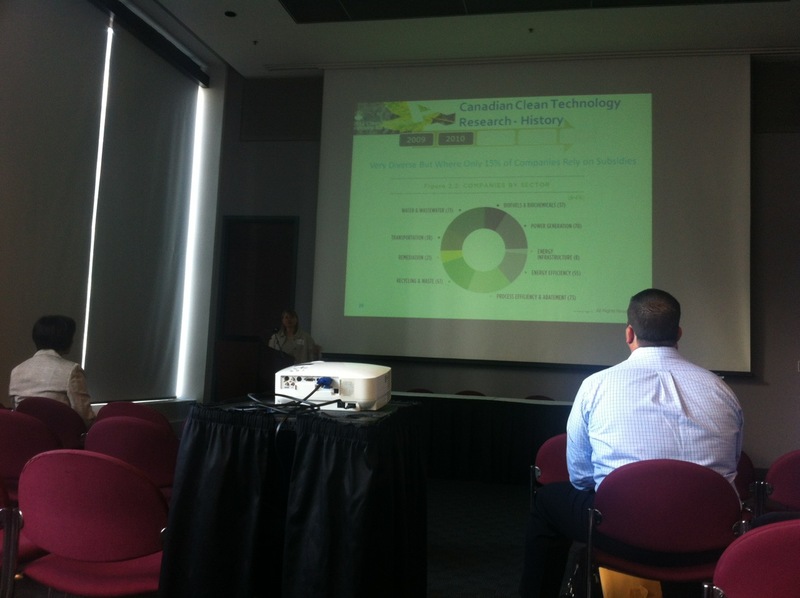 Yesterday, I visited an information session by Céline Bak from Analytica Advisors on the launch of their “2012 Canadian Clean Technology Industry Survey” which will form the basis of their “2013 Canadian Clean Technology Industry Report”. This gave me the opportunity to gather some insights into the current state of the Canadian cleantech industry and the road ahead for this diverse, exciting and growing sector. Primary research with confidential data and other input from over 700 cleantech companies should now further examine the findings from their previous reports in 2010 and 2011 and establish benchmarks for the industry. Moreover, their 2013 report should give an overview on the current state of the industry, the main challenges that it is facing, its contribution to the Canadian economy in terms of revenue, growth, employment and R&D investments and the exports markets of interest to Canadian cleantech companies. In fact, the Canadian cleantech industry in 2010 employed 44,000 people, had revenues of $9 billion (thereof $5 billion in exports) and invested $985 million in R&D. Its revenue figure corresponds to a 1% global cleantech market share that is expected to grow to 2% or $60 billion by 2020. According to Céline Bak, this growth would mean that Canada’s cleantech sector would significantly exceed the previous target of building 20 Canadian cleantech companies with $100 million in revenues by 2020. This growth is also attributable to the diversity of cleantech in Canada, including companies active in power generation, water, energy efficiency, process efficiency, recycling, transportation, remediation, biofuels and energy infrastructure.